The Head of State in his speech said that Korea and Indonesia were long-time friends and that there were many Korean companies operating in Indonesia. "Korean companies operate in Indonesia for many years and employ 900 thousand workers," he said. 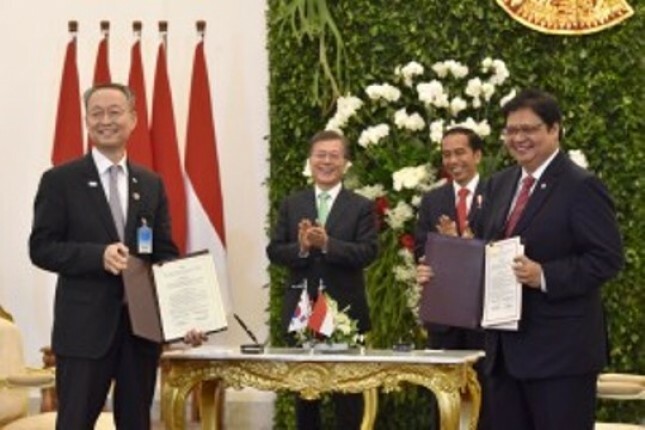 For information, Foreign Minister Retno Marsudi also explained that last year Indonesia and South Korea posted a significant increase in trade of almost 20%, namely precisely at 19.2%. Regarding the Memorandum of Understanding (MoU) to be signed, Ambassador Umar Hadi said that there were several sectors including automotive, metal industry, chemical, garment, footware, and start-up. In the Indonesia-Korea Business and Investment Forum, the President was accompanied by several Working Cabinet ministers, including Coordinating Minister for Political, Legal and Security Affairs Wiranto, Industry Minister Airlangga Hartarto, Foreign Minister Retno Marsudi, Head of BKPM Thomas Lembong, Head of the Creative Agency Triawan Munaf, Indonesian Ambassador to South Korea Umar Hadi and Chairman of the Indonesian Chamber of Commerce and Industry, Rosan Perkasa Roeslani. While from South Korea also attended and gave a speech from the Minister of Trade, Industry and Energy Ungyu Paik.